Keeping with the theme this week of personal care, I decided to dust off and update a previous article focusing on the bathroom. Whether calling it the bathroom, powder room, dressing room, toilet, or any other acceptable term or slang, houses even in the bygone days before indoor plumbing included a room (or rooms) for broad hygiene purposes. Indeed, it is a comprehensive topic and unlike many objects and past inventions that have straightforward and/or uninteresting histories, when referring to waste management and hygiene, the evolution is fascinating and convoluted. Terminology and etymology are always helpful, but there are SO many words associated with this topic that I shall space it amongst the history. As with many facts I have discovered while studying history, it seems that our ancient ancestors were quite intelligent and forward thinking. Archeological evidence shows that the concept of a flush toilet goes as far back as King Minos on the Island of Crete around 1700 BC, and in India around 2000 BC. The Romans and Persians also have extensive evidence of sophisticated systems for washing away human waste. Plumbing in all its applications was something these cultures did very well, in fact. In all of these civilizations, the bathrooms were public and connected to water drainage structures that were enclosed and separate from other water sources. As I said, very sophisticated and hygienic, but not to the point of commonly appearing in individual houses. Tragically, in the centuries after the fall of the Roman Empire and the subsequent plagues that wiped out most of Europe, plunging the known world into the aptly named Dark Ages, advances in technology and learning were lost. Filth and squalor were all too common, and ignorance, superstition, and downright stupidity ruled for decades. So it was with hygiene habits and technology. Although various inventions for personal elimination and waste removal would crop up now and again, the intervening centuries were primarily ones of the chamber pot or just squatting behind a bush. The medieval garderobe (1000 – 1480s) was a huge step forward, believe it or not, in that no pot emptying was required. Outhouses with deep holes were most typical. The age of the Tudors and Stuarts (1485 – 1700) began to see some advancement, especially with creating chamber pots that were comfortable and pretty. 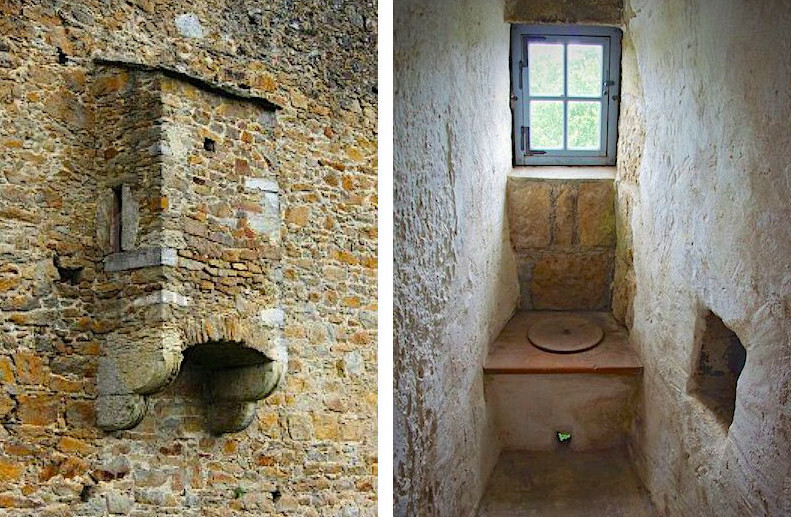 Garderobes were small rooms in medieval castles that jutted out from the stone walls with holes in the bottom so waste would fall into the moat or cesspit below. Wooden planks would serve as the sitting surface and sometimes there would be chutes for the waste, but typically it would fall freely. These tiny chambers also served as the storage place for their finest clothing because, odd as it sounds, the stench kept moths away, thus preserving the garments. Castle garderobe outside and inside. Sewer systems were created in London and other larger cities, and if they emptied into the river, so what? At least the act of elimination was a bit more pleasant if the waste was immediately washed away. In time, of course, this would prove to be a tragic problem. Medieval London was still a small city, comparatively, but that would change with the Industrial Revolution of the late 1700s onward. Sewage pipes were frequently clogged with dead animals and other unmentionable products. I will allow your individual imaginations to envision the result of so much standing sewage. The influx of people led to rising disease, stench, and death, much of it directly tied to human waste. Here is a short essay on the Sewers of London if you want to know the brutal, smelly truth. Drainage not piped into the rivers was directly dumped into the streets. Houses in London often had a cesspit in the cellar, this separated chamber specific for the collection of sewage and attached to the city’s archaic sewer system. If lucky, the cesspit was functional, but too often it was not. Even worse, many houses did not have a collection pit, so the waste was tossed out the window onto the street. In the country, a cesspit was often part of the moat or located under the privy or garderobe, or in a location fairly close to the house with better water flow. Gong farmer: Also called a gongfermor, this was the Oh-so-lucky guy who emptied the cesspits. The waste, known as “night soil” was collected and taken to places outside the city boundaries. Sometimes it was sold for fertilizer and people could actually make money off their own waste. Apparently, they earned a decent wage, but were only allowed to work at night, had to live sequestered with other gong farmers, and frequently died from the noxious fumes or by falling into the pit. As for the name, all I could find was one reference to gong being a term similar to dung. Saltpeter man: These men extracted the nitrates from the collected excrement so it could be used to make gunpowder. Strictly speaking, a water closet only refers to a flushing toilet in its various incarnations over the centuries. In a broader sense, a water closet is a room where the toilet would reside. As mechanisms for flushing human waste were invented, the people involved would have called them a water closet and not a toilet. The first real water closet is attributed to Sir John Harrington in 1596. He was an inventor and also the godson of Queen Elizabeth I. No one knows precisely how his device worked, but it is recorded that his godmother loved it and insisted on having one installed in her palace. The Queen would use it until the day she died, as did Sir John use the one made for himself, but the trend never caught on. The story goes that he was ridiculed for his absurd invention (probably not in front of the Queen) and never built any others but these two. His water closet was later destroyed and it would be nearly 200 years before anyone else tackled the idea. 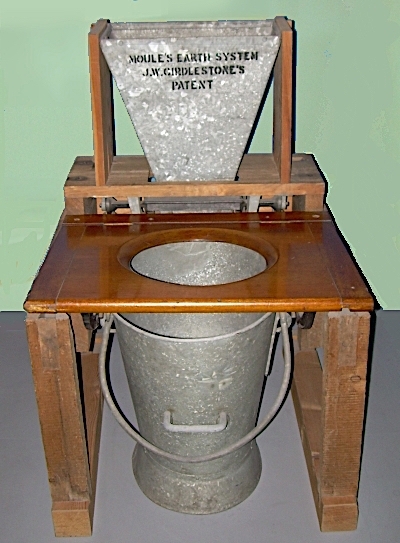 In 1738 JF Brondel introduced the valve type flush toilet, but it was Alexander Cummings who improved upon the device and received the first patent in 1775 for the “strap” – basically a chamber pot with a sliding valve between the bowl and the water trap. Others soon followed Cummings’ lead in rapid succession. The plunger closet was patented in 1777 by Samuel Prosser, and one year later Joseph Bramah patented his version with a more secure hinge valve and in twenty years had installed 6000 of them. These early toilets were self-contained and still needed to be manually emptied and cleaned, but did solve some of the issues regarding odor, while paving the way for toilets that would be linked to sewer or septic systems. That would be an ongoing problem that would not be truly resolved and a standard in most parts of the world until well into the 20th century. With those improvements came the concept of elaborate bathrooms as we have today. By the Regency Era, the water closet was an accepted mechanism no longer open to the laughter and ridicule of Sir John’s gadget for Queen Elizabeth. Therefore, a wealthy household, such as Pemberley, could easily include flushing water closets. Nevertheless, the basic chamber pot would remain a much more accessible standard. A chamber pot is a bowl-shaped container with a handle and a lid constructed of varying materials, usually porcelain. It was kept hidden from view in some way, either under the bed in the bedroom, in a concealing cabinet, or in a separate room. The above slideshow is examples of chamber pots from the 18th to early-19th centuries. As the main way humans “did their business,” creative people produced chamber pot furniture that was both attractive and multi-use. Examples of chamber pot furniture are in the slideshow below. Until roughly 1850, a commode in England referred to a cabinet serving as a washstand with drawers to store soap and towels. The inclusion of an enclosed area to store a chamber pot evolved, the idea of conveniently combining the place to relieve oneself with washing afterward a natural step. Other clever, creative men focused on improving the technology of a flushing device. The simple fact is, the flushing toilet is one of the greatest inventions of all time. Without a truly functioning toilet and sewer system, highly populated cities could not exist. London during the Industrial Revolution was the largest city in the world, no debate. It would take nearly a hundred years to catch up, waste management wise, but the rapid increase in human bodies that must relieve themselves led to the serious contemplation of how to fix the problem. Therefore, a ton of men over those decades came up with all kinds of ideas, some that worked and some that did not, and no one person can be given total credit. England, specifically London, was the center of the toilet industry! Outhouses and cesspits often utilized dirt or ash kept at hand to toss over the waste. This concept led to a battle, of sorts, in toilet technology. While most inventors were looking at water as the logical way to deal with waste, others were looking at soil. We know which medium eventually won, but for decades the war raged. Various devices employing dry materials were patented beginning in the mid-1800s, but the patented “earth closet” created by Reverend Henry Moule in 1860 was the most successful. 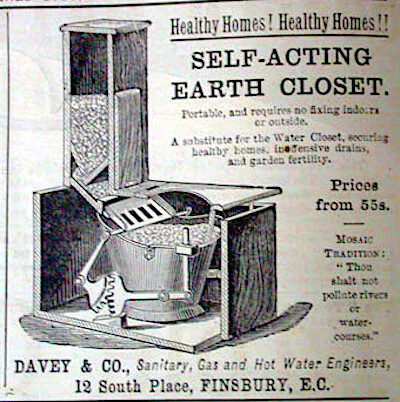 The earth closet was essentially a kitty-litter type device using absorbent clay or plain old-fashioned dirt to cover the excrement. Queen Victoria preferred the earth closet and installed one at Windsor Castle. (noun) – late 14c. From Late Latin lavatorium> “place for washing, washbasin,” noun use of Latin adjective lavatorius> “pertaining to washing.” The sense of “washroom” is first attested in the 1650s; as a euphemism for “toilet, water closet,” is attested by 1864. Toilet or Toilette acquired an association with upper-class dressing by the 18c. through the specific sense of “a fine cloth cover on the dressing table for the articles spread upon it.” This evolved to “the articles, collectively, used in dressing” (mirror, bottles, brushes, combs, etc.). Subsequent evolution in English (mostly following French uses) was to the “act or process of dressing,” especially the dressing and powdering of the hair (1680s); then to mean “a dressing room,” especially one with a lavatory attached (1819). At this point, the toilet was more what we would call a dressing room. The usage of toilet for the “lavatory or porcelain plumbing fixture” was a much later evolution (1895), but as an American euphemistic use only. Never British. Most likely this was probably a polite, inoffensive terminology for the modern combo chambers we are familiar with, along the lines of “powder room” or “restroom.” The use of toilet for the porcelain bowl itself is still today not readily accepted in all cultures, many preferring commodes or some other nicer sounding word. (noun) – 1922 or 1940. Perhaps [Dictionary of American Slang] from French lieux d’aisances> “lavatory,” literally “place of ease,” picked up by British servicemen in France during World War I. A chiefly British word for the bathroom, loo has a debatable etymology. The above WWI reference is the most plausible, based on the first written appearance of loo as a joke in “Ulysses” by James Joyce (1922): “O yes, mon loup. How much cost? Waterloo. Watercloset.” Joyce’s joke is believed to derive from the Waterloo brand iron cisterns commonly used in British outhouses in the 1900s. Date-wise, this origin for loo fits but is not at all definitive. The most common repeated origin for loo is also the least likely: That it is a corruption of the French phrase gardez L’eau> “Watch out for the water” yelled to warn any passersby that a chamber pot was about to be dumped into the street. This dubious etymology is one of several more just as strange, the final conclusion being that no one knows how the word originated or when. 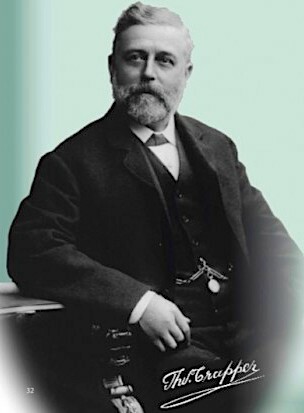 Thomas Crapper – As cool as it is to think a man with this unfortunate surname invented the flush toilet, Mr. Crapper had absolutely nothing to do with it. In 1861, Crapper founded a plumbing supply business, the Thomas Crapper and Co. Ltd. in London. He was a shrewd businessman, a master plumber who heavily promoted sanitary plumbing, held nine patents for plumbing-related inventions, and pioneered the concept of the bathroom fittings showroom. He received several Royal Warrants from both King Edward VII and George V. Clearly Mr. Crapper was involved in the industry, yet there is not a shred of evidence that the slang terms “crap” or “crapper” are related to him. By the 14th century, massive quantities of sheeted paper were being produced in China. In other parts of the world, cleaning up after doing one’s business was accomplished with whatever was handy: paper (more readily available after the printing press was invented), cloth, moss, wool, hemp, wood shavings, shells, sticks, leaves, grass, hay, feathers, corn cobs, snow, and so on. Water, of course, when available was the preferred cleaning substance. The Roman public bathrooms kept a sponge adhered to a stick soaking in a bucket of saltwater that would be reused by everyone. When it comes to modern toilet paper revolution, the United States led the charge. In large part, this was due to the paper industry focusing on advanced methods of printing and creation. With improved paper processing, manufacturing softer, rolled, and perforated toilet paper became possible. In 1857 Joseph Gayetty sold the first factory-made paper in the US. His aloe-infused sheets of manila hemp dispensed from pull-out boxes and were primarily marketed as medicinal wipes. Gayetty claimed his sheets prevented hemorrhoids and he was so proud of his invention that he printed his name on each sheet. The first patent for rolled, perforated paper branded “The Standard” goes to Seth Wheeler of Albany, NY. Between 1871-1883 Wheeler obtained a number of patents including ones for the dispenser tubes and brackets. As a vital aside, a 1891 ad illustration (left) of Wheeler’s paper ends the OVER or UNDER debate! Toilet paper as a wide-spread product took its next leap forward in 1890 when two brothers named Clarence and E. Irvin Scott popularized the concept of toilet paper on a roll by targeting sales to hotels and drug stores. The Scott Paper Company of Philadelphia was a very successful business as a whole, and although people remained hesitant to purchase such an unmentionable product from a public store until well into the 20th century, the convenience of rolled and perforated paper in the bathroom eventually triumphed over embarrassment. My grandfather in Mississippi kept a pee can under the bed so we didn’t have to walk out in the cold to use the outhouse. When we moved into our present home the “powder room” had a sign on it, Water Closet. I left I on. Fabulous research and information/ Thanks. Another reason for not wanting to live in regency times. A burst water pipe near me a few months ago meant I had no water all day and that was enough of an ordeal for me. It was such a relief when it came back on. I love some of the decorated chamber pots in your pictures and the actual painted toilet at the top is far too lovely to use. Some of the commodes look way too complicated so thank goodness I’m not relying on one of those. I totally agree. I honestly believe that running water and flushing toilets is the main reason I could never live before the 20th century. Even when we would go camping with our RV, the limited water and weird toilets would get to me by the end of two weeks!